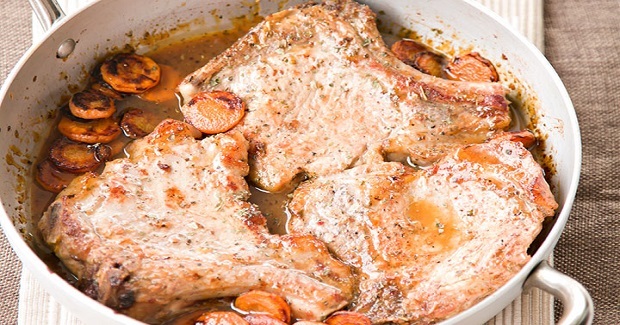 Juicy Flavorful Pork Chops Recipe - Gutom Na! Posted on Friday, September 23rd, 2016 at 2:22 pm. Whisk Worcestershire sauce, honey, mustard and white wine in a bowl until marinade is smooth. Pour the sauce into a sealable plastic bag. Add the pork chops to the plastic bag, coat with the marinade, squeeze to remove excess air and seal the bag. Marinate in the refrigerator for at least 5 hours. In a large skillet, heat oil over medium heat. Remove pork chops from the marinade, and grill pork chops 2-3 minutes on each side. Sprinkle with oregano, salt and black pepper. Pour the marinade over chops and bring to a boil. On a medium heat, simmer for 8-10 minutes or until a thermometer reads 145° Fahrenheit (63° Celsius). Let stand 5 minutes before serving. Serve with nicely browned carrot.